NPF Socialna poddergka :: Managed funds :: asset management company "Vseswit"
Open non-state pension fund «Socialna poddergka» (abbreviation is the Pension Fund « Socialna poddergka») was registered on the 3th of May, 2006. 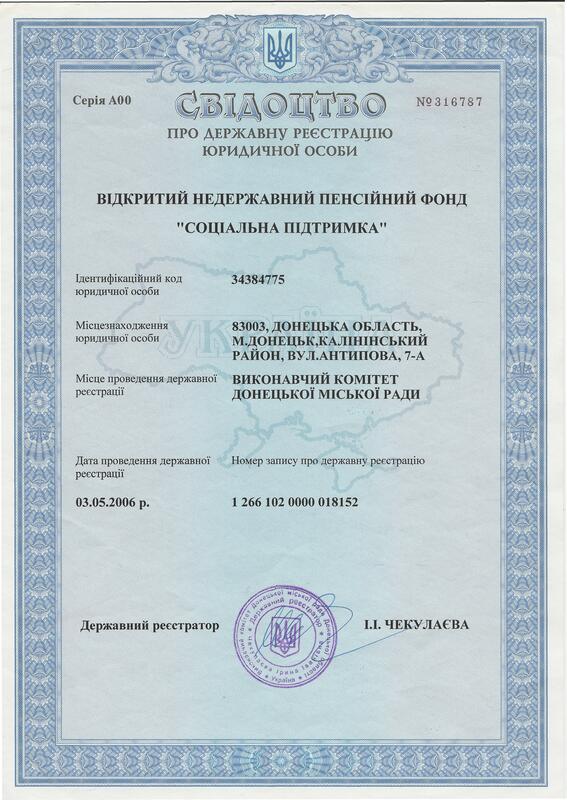 The certificate of registration for financial institution: series PF №74. The decision to issue the certificate: № 6018 of 19 July 2006. • Providing a reliable long-term securing of pension savings. • Maintenance of an optimal correlation between the liabilities of the fund and liquidity of the assets. • Providing of the minimal profitability of the investment portfolio at a rate 3%-4% higher than the real level of inflation. • Development of the fund’s investment strategy considering the interests of the fund’s contributors as much as possible. • Unconditional guarantee of the rights and legal interests of fund’s participants since the conclusion of the pension contract. Administrator of NPF «Socialna poddergka» – «All-Ukrainian Pension Fund’s Administrator» Ltd is a professional administrator with an exclusive activity – administrating of non-state pension funds. Asset managing company – «Asset managing company «Business-invest» .